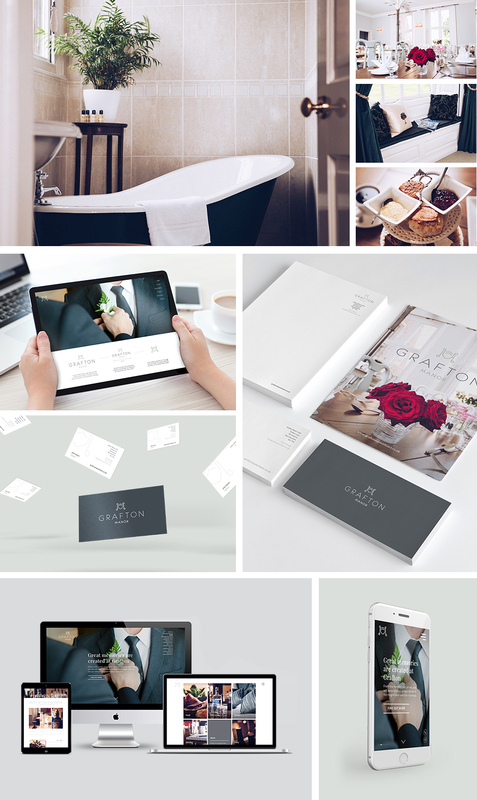 grafton manor gets a dramatic makeover in all departments from logo to award-winning website. Our challenge was the reinvention of a traditional hotel that supersedes the expectations of the experienced traveller and wedding party. A fully integrated brand refresh, including a photoshoot and a new logo led to a clean and contemporary identity, mirrored perfectly by the fully responsive website. Today, Grafton is a thriving country house hotel and a haven of tranquility for their guests. Steeped in history, the Manor is packed with original features, character, and charm. Enter through the historic porch and enjoy a warm welcome at the Gin Bar where you can begin to relax ahead of spending an evening in one of their luxurious en suite bedrooms, with all amenities to keep you in modern comfort, set in historic grandeur.